The last week of August was a whirlwind, especially for jebra. On Thursday, the Jazz Band played their summer concert at Heritage Park. We couldn't have asked for better weather and the band played great. Afterwards we returned to work to stash the instruments and equipment jebra would need the following Monday for the FCB's final concert of its 52nd Season. We both took Friday as vacation days, jebra so that he could travel to Pittsburgh for Confluence and I could stay behind without leasing a car. While he was off doing security, I spent most the weekend on my corner of the couch playing on the internet and crafting. I knocked out three cat beds plus I knit one of the hats I agreed to create for the Guild's summer charity project. I am half way through the second hat and have enough yarn for another hat or two once this one is done. jebra returned home fairly late and I was still up doing laundry. Nevertheless we were up at the normal time Monday morning. 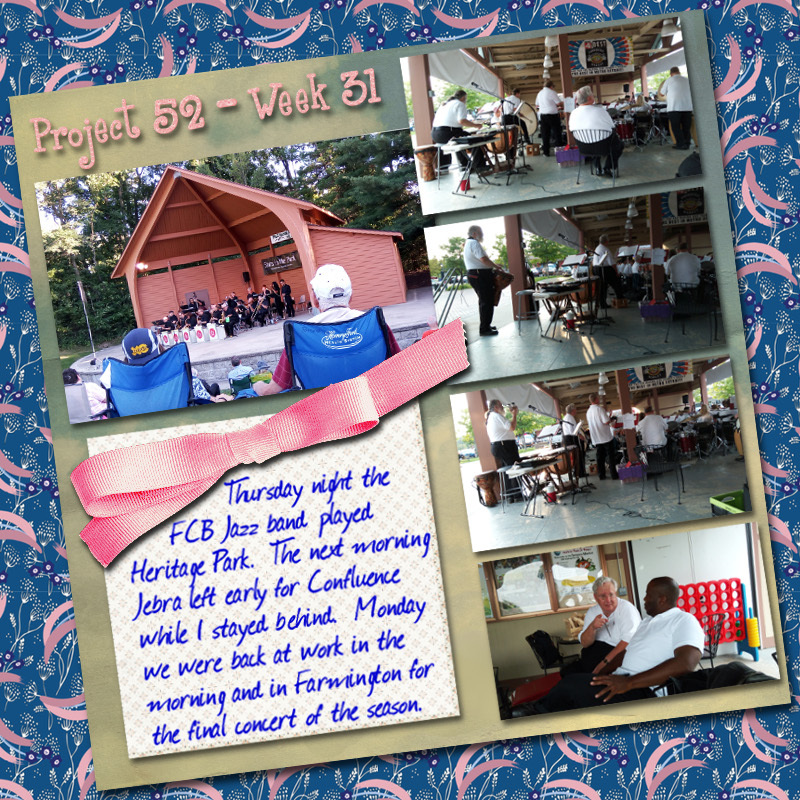 We had to leave work early to get to Farmington to set up for the final concert of the year. It rained on us on the way there but fortunately the weather cleared up and the concert went on. Afterwards a few of us went out for a late dinner, then it was time to go home and do my exercises and get ready for bed. Yesterday was work followed by grocery shopping then exercise and shower and designing a birthday card. ETA: I was too tired to add more commentary to the Project 52 page last night, but I want to point out a few things. The bottom right-hand photo is actually the first photo I took on Monday. That's Mike, the band's president, pointing at me. Seated next to him is Damien Crutcher, our esteemed conductor. I sat under the pavilion and behind the band for the entire concert, so all of my photos were taken from my chair. What I meant for the top three to illustrate was the many instruments of the percussion section and the three very different ones jebra played that night: Timpani, Djembe, and Shakers.